Interested in winning a Gerber multi-tool? Check this out! It’s been over a week since I did this daytrip, but I hadn’t been able to find the time to write about it until now. Our first week of “normal life” at our new location was pretty busy! Anyhoo, I hopped in the car the first Saturday of May and headed out to “my preeeecious” campsite and surrounding woods near my mother-in-law’s cabin. I wanted to check for signs of spring, as well as any last remnants of winter. 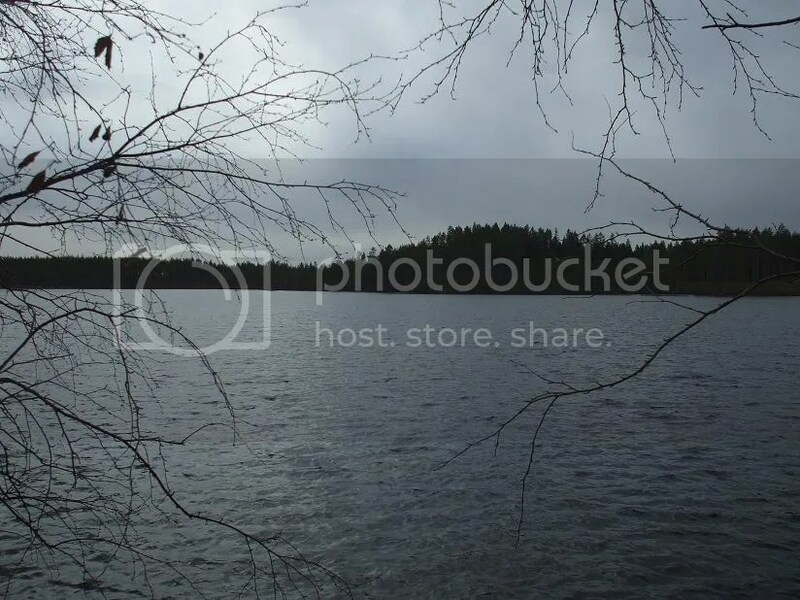 My first stop was the lake. 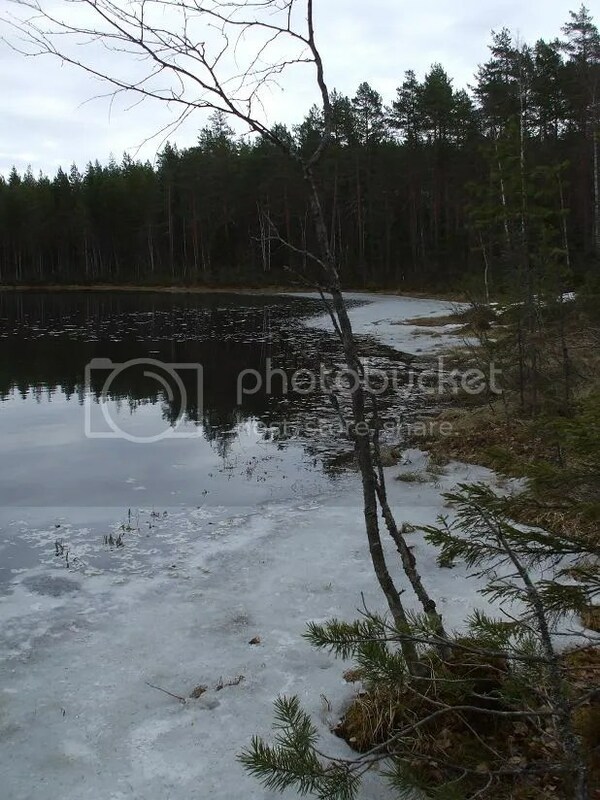 There was no ice left whatsoever, but no leaf growth on the trees, either. 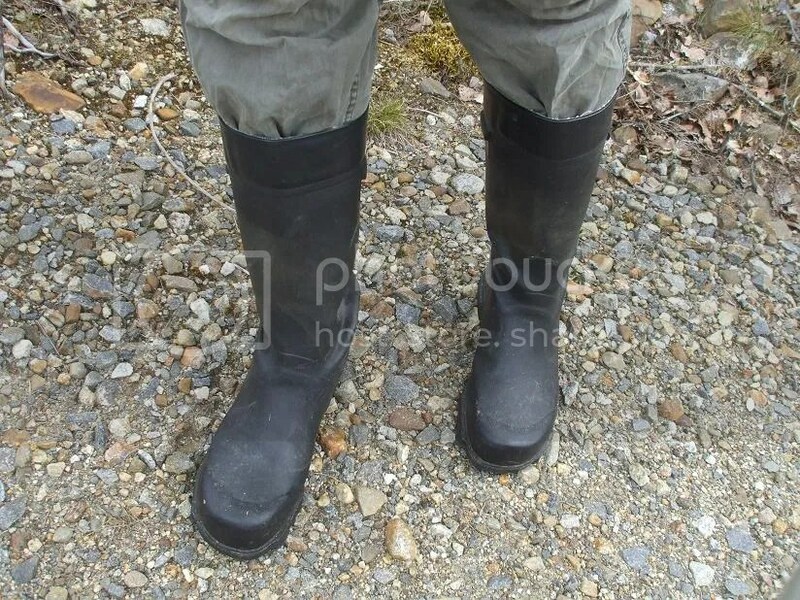 Normal hiking boots are usually OK for this area at this time of year, but I decided to wear my rubber boots as a precaution, seeing as how spring has come late this year. 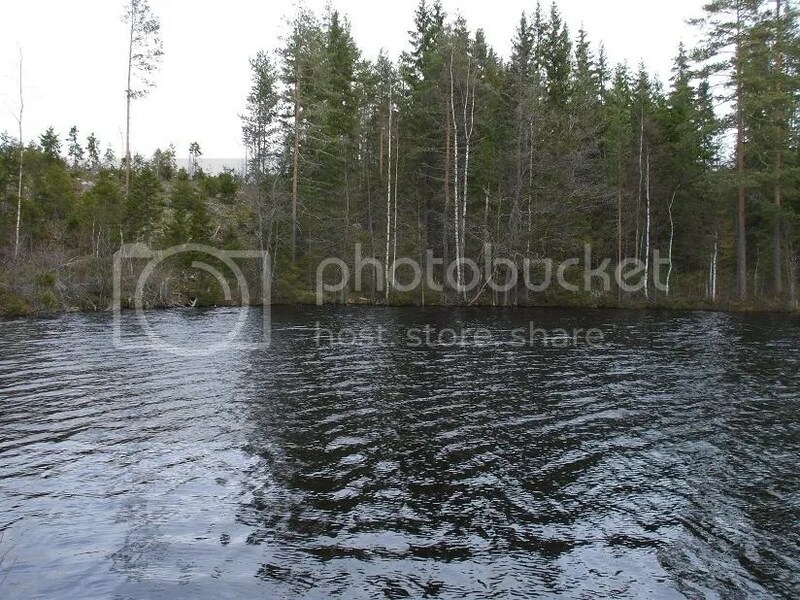 It was a good thing, too, because the ground was still water-logged in some places. 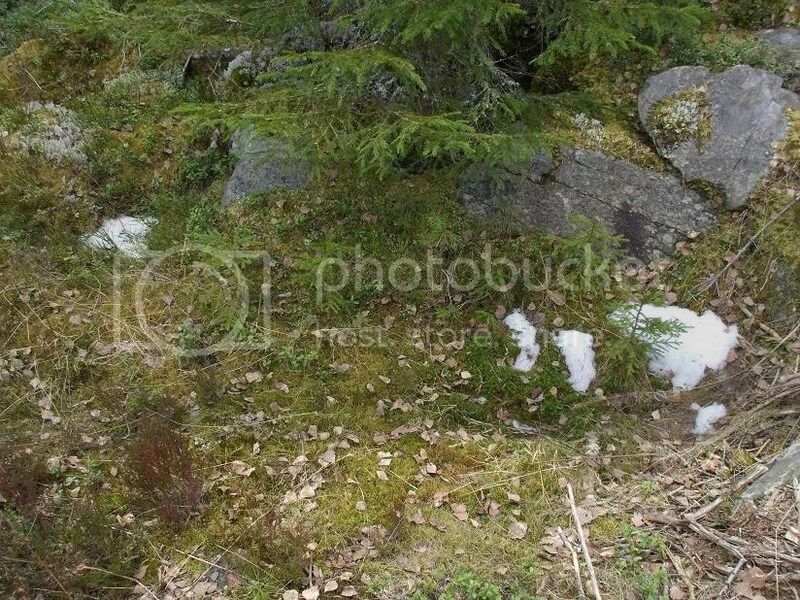 I noticed a few tiny patches of snow here and there. 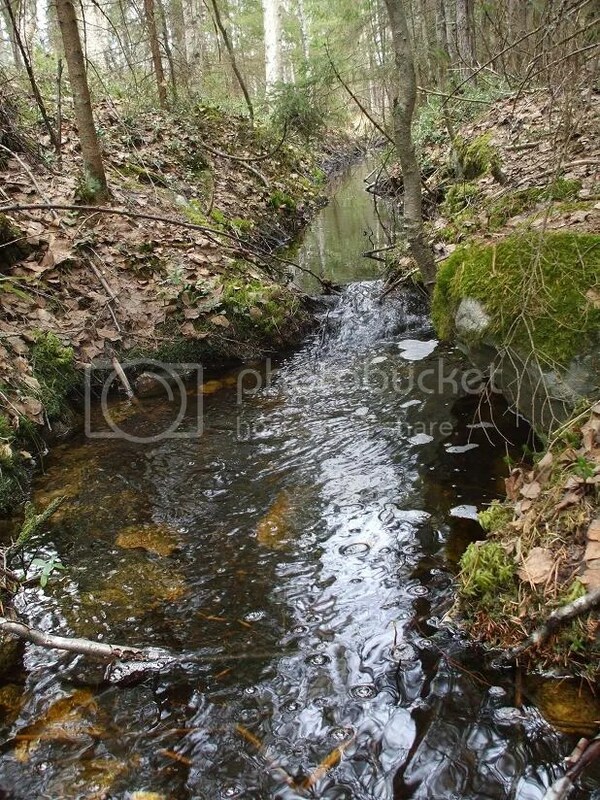 And some very wet areas, as well. As you can see, a little water was also coming from the sky at this point. 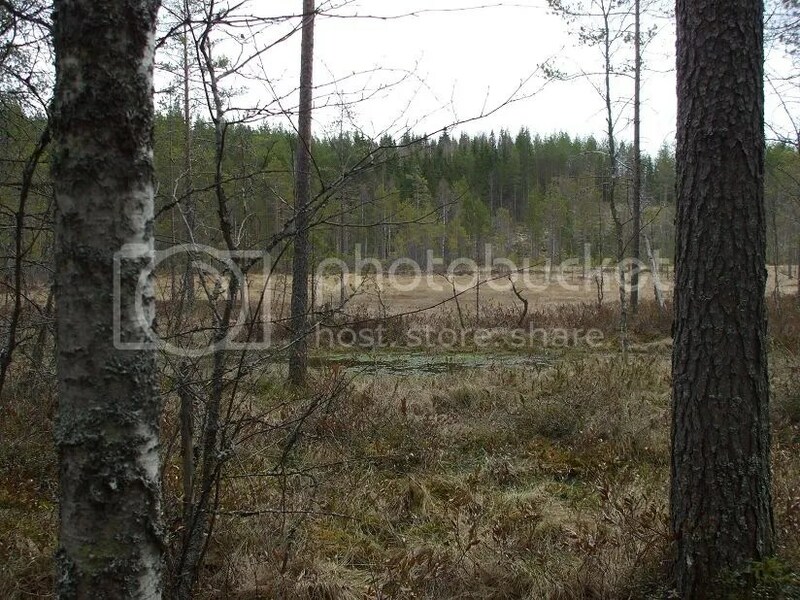 Otherwise, the forest was snow-free. 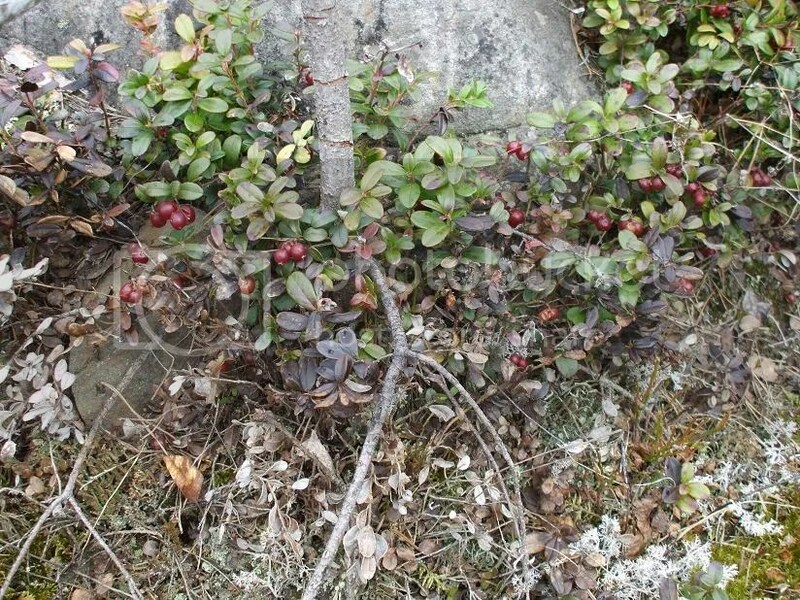 Plenty of cowberries from last summer/autumn could be found. I believe they contain a lot of natural preservatives, which is why they last so long. 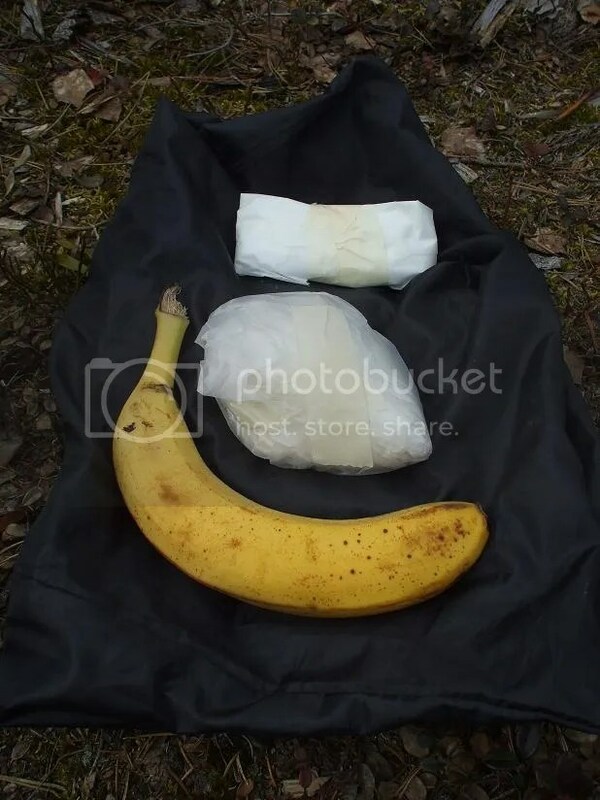 When I reached my campsite, I dropped my new old pack and snapped a few pics of it. By “new” I mean new to me, and by “old”, I mean military surplus. I picked it up at a discount store and am putting it through its paces now. Stay tuned for an overview and preliminary review. I continued on through the forest. 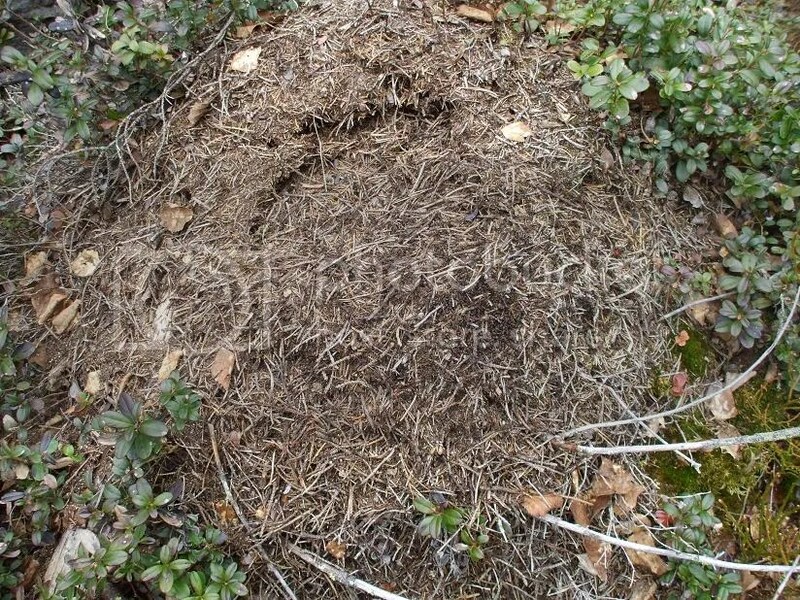 Here’s a big anthill teeming with ants. 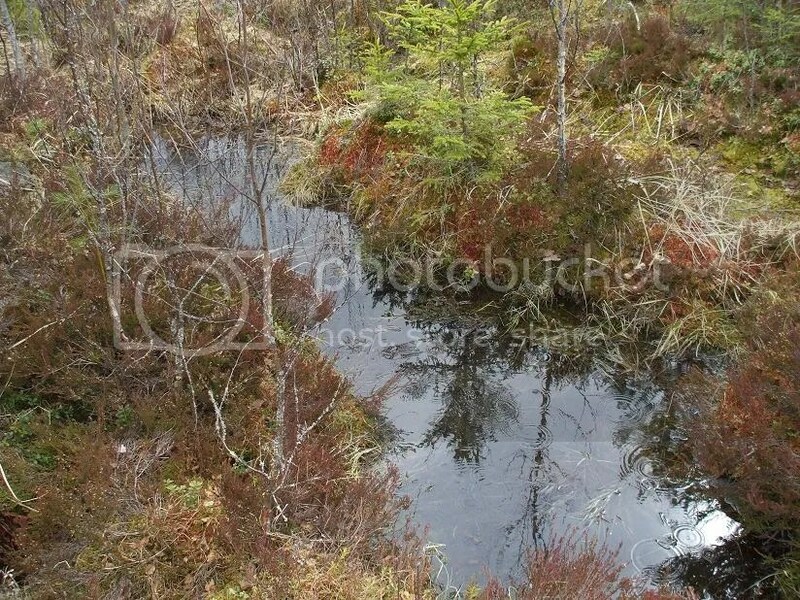 Here’s a shot of a swampy area nearby where cloudberries are said to grow. I’ll be sure to look for some this summer. 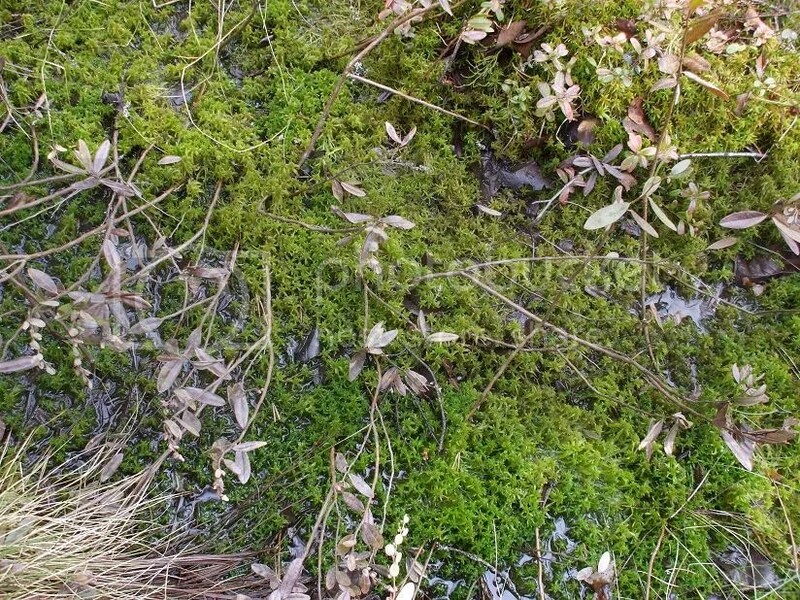 Water-logged mossy ground at the edge of the swamp. The drainage canals are still swollen due to the recently melted snow. 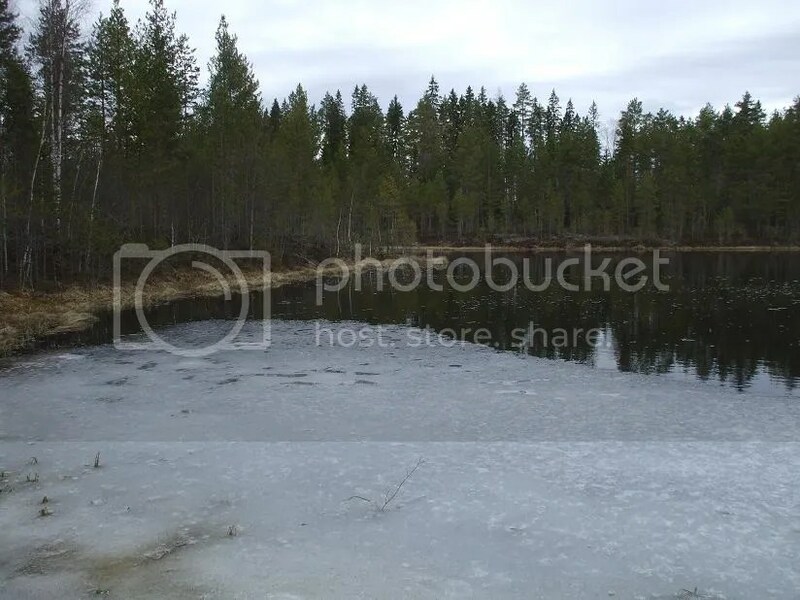 When I got to the pond, I saw that it was still partially frozen. 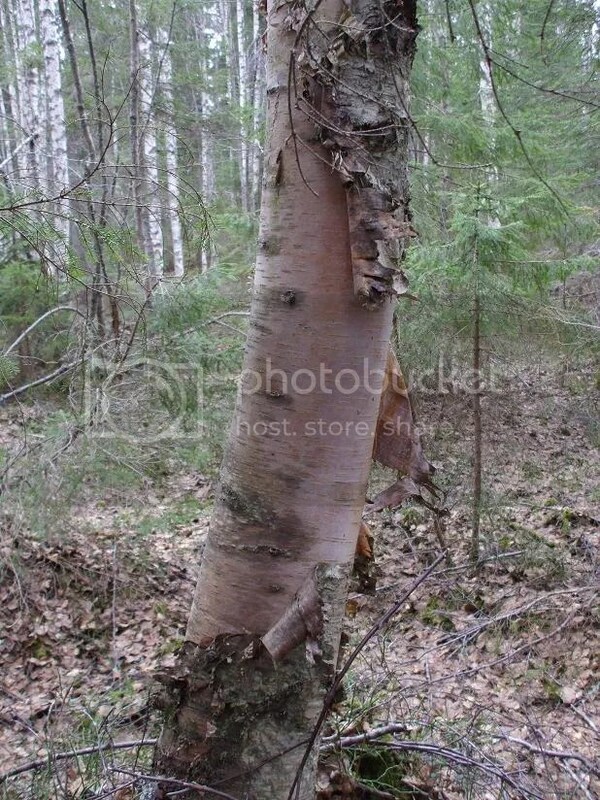 On my way back to the campsite, I spotted this birch, which I had not seen before. 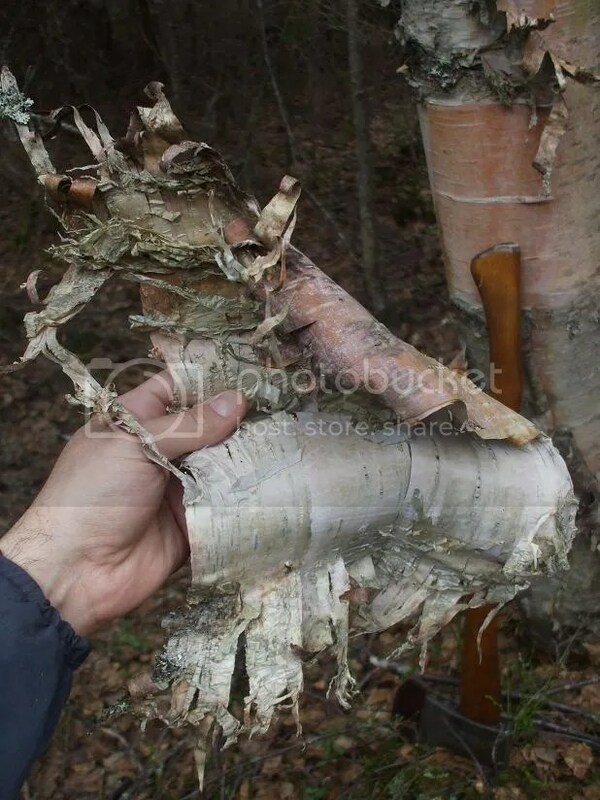 For some reason, a minority of birches have a lot more bark peeling off them than others. 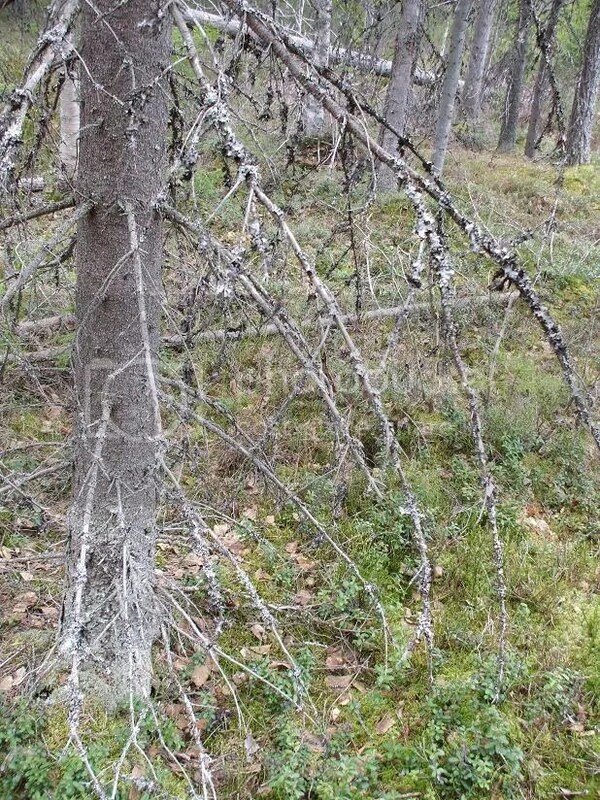 I try to remember where these trees are so I can collect tinder there from time to time. 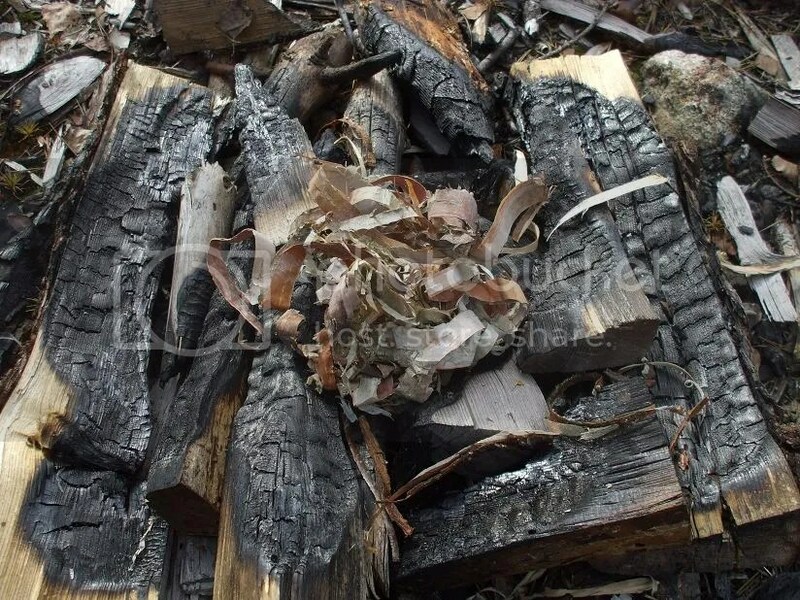 Since I’d be making a fire soon, I collected some of the bark. Close by, I discovered a spruce tree which had been damaged at some point and then oozed resin to seal off the damage. I don’t think I’ve seen anything quite like this before. I snapped off a few of the pieces for future use. 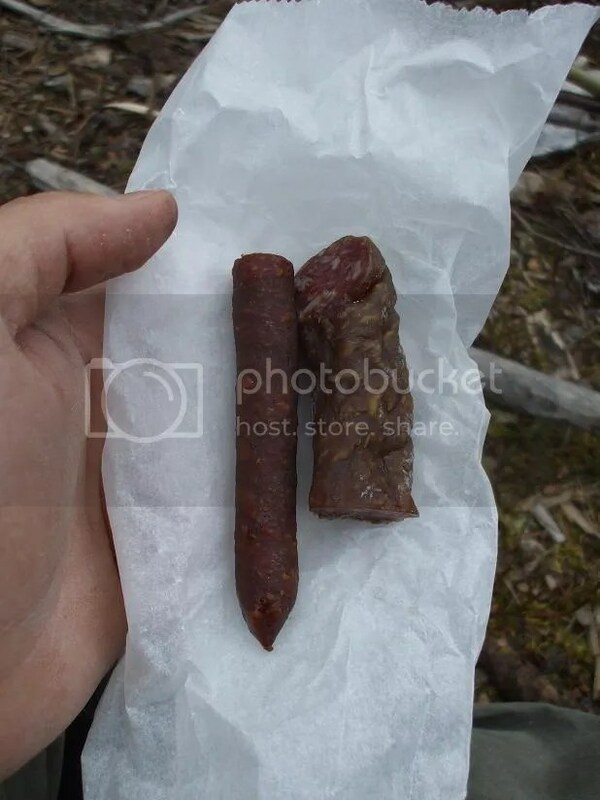 Having recently learned that spruce resin can be chewed like gum, I picked off some of the cleanest amber-colored pieces I could find on the tree and popped them in my mouth. The flavor took some getting used to, but the texture was great (much better than store-bought gum, in my opinion). Looks just like any other gum! 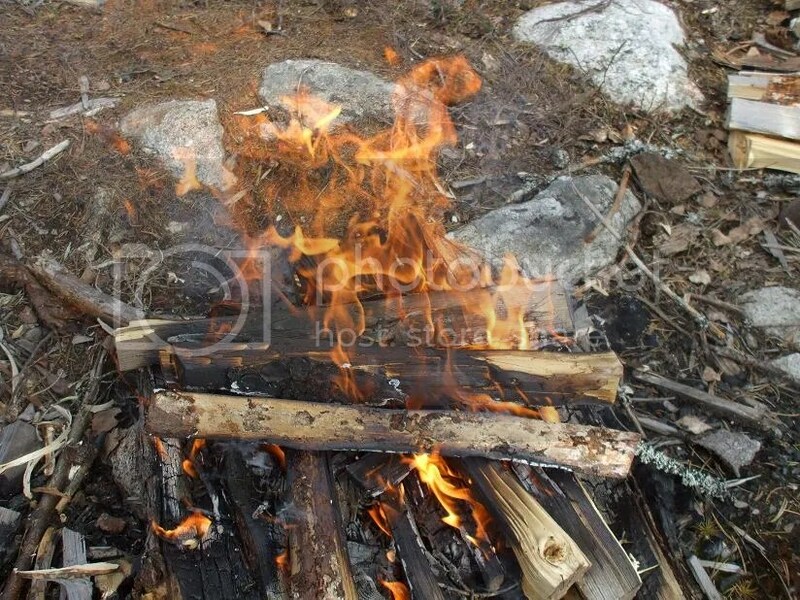 Needing kindling for my lunch fire, I snapped some dead lower branches off another spruce tree. When doing it the first way, be sure the point of impact is no further forward than directly between your feet. 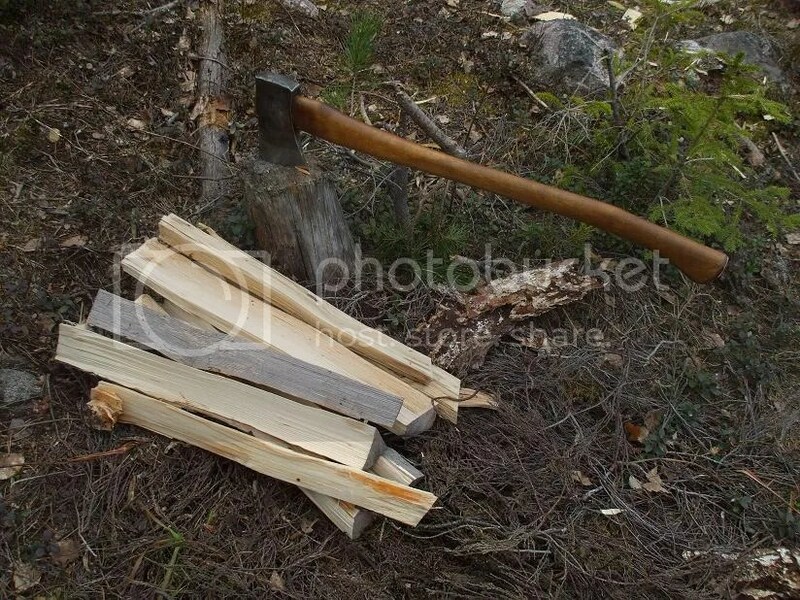 Otherwise, you could get hit by the axe if it glances! While splitting the wood down further, I found a surprise! I saved it for later use as fishing bait. Finally, lunchtime had arrived. I set up near one of the fire places. 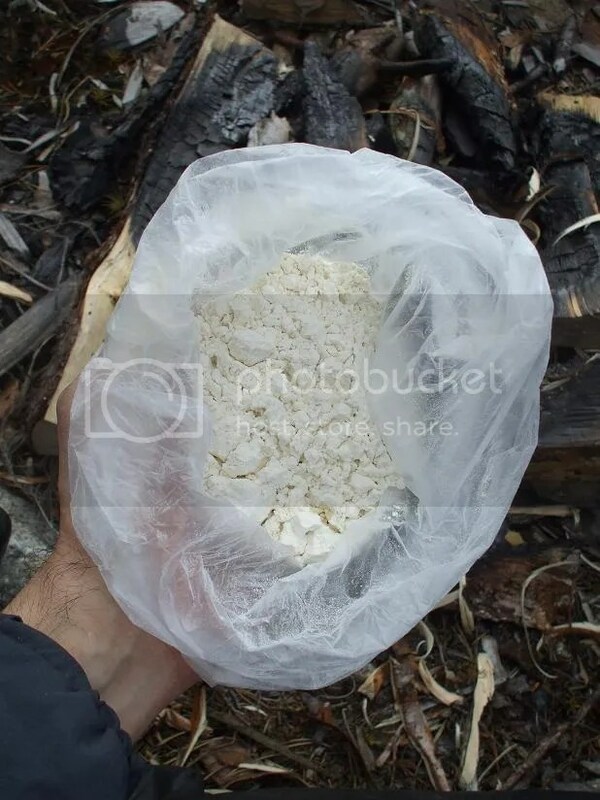 One mystery package contained bannock mix. 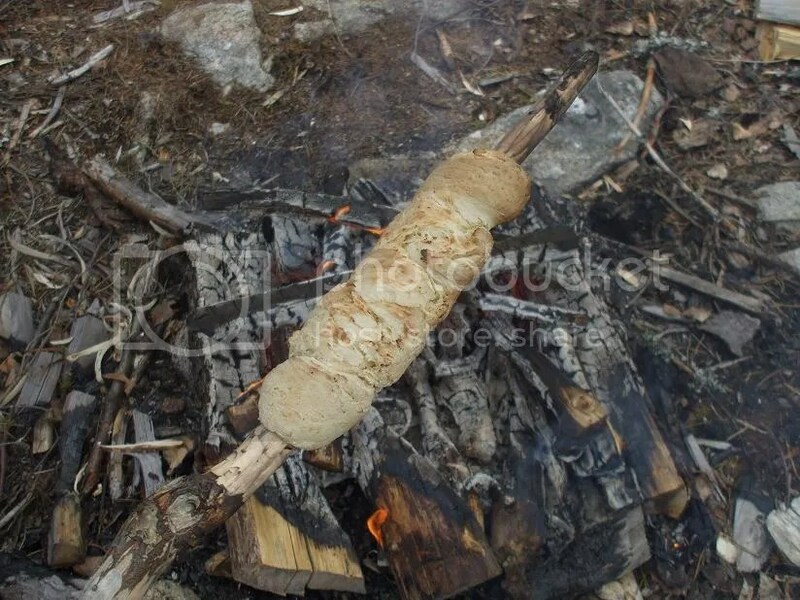 I got a bakin’ stick ready and then mixed some water into the bannock mix to make it into a dough. 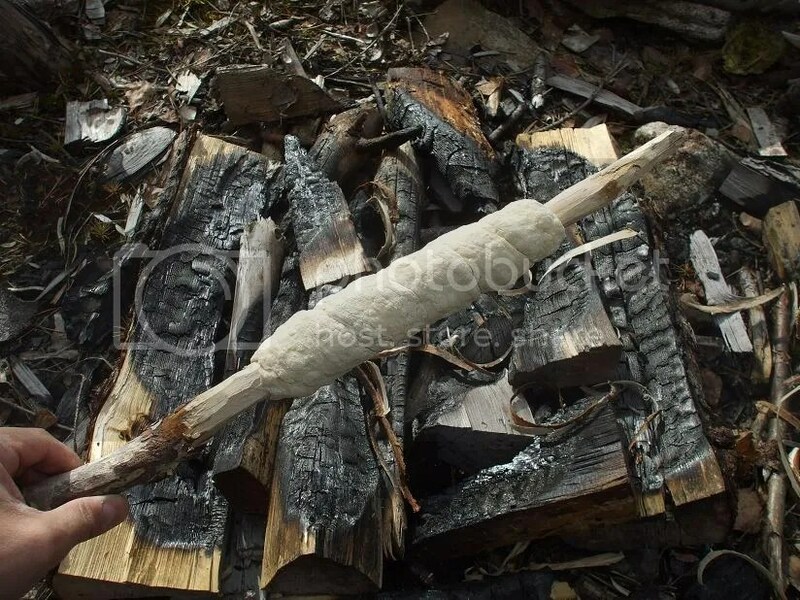 I squeezed it into a long strip and wrapped it around the stick. Now to get the fire started. 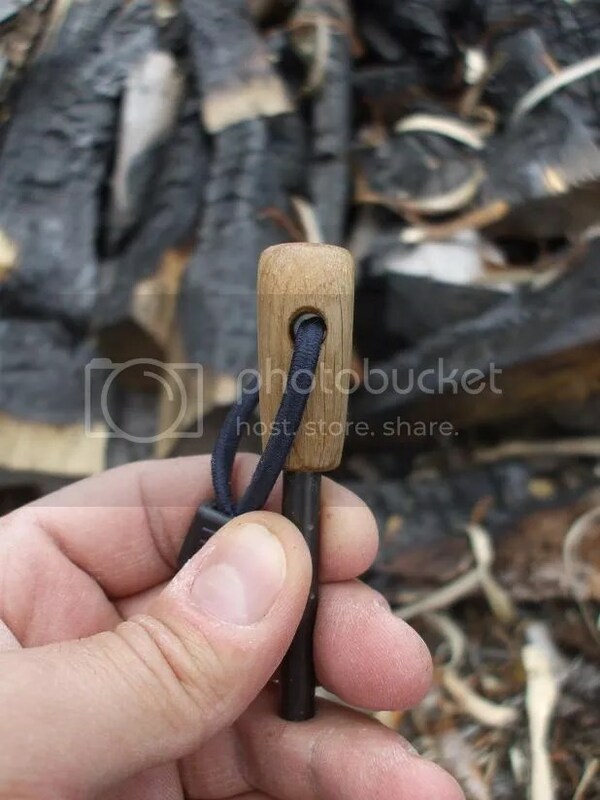 I used the wood-handled firesteel I bought for 1 Euro and modified so it would fit better in the loop in my sheath. Here’s the slimmed-down profile. 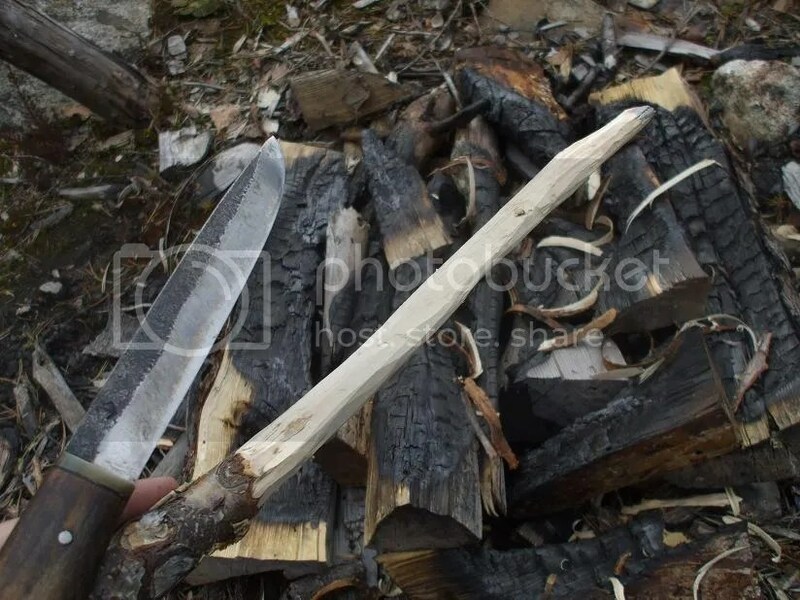 I shredded the birch bark and lit it with the firesteel. 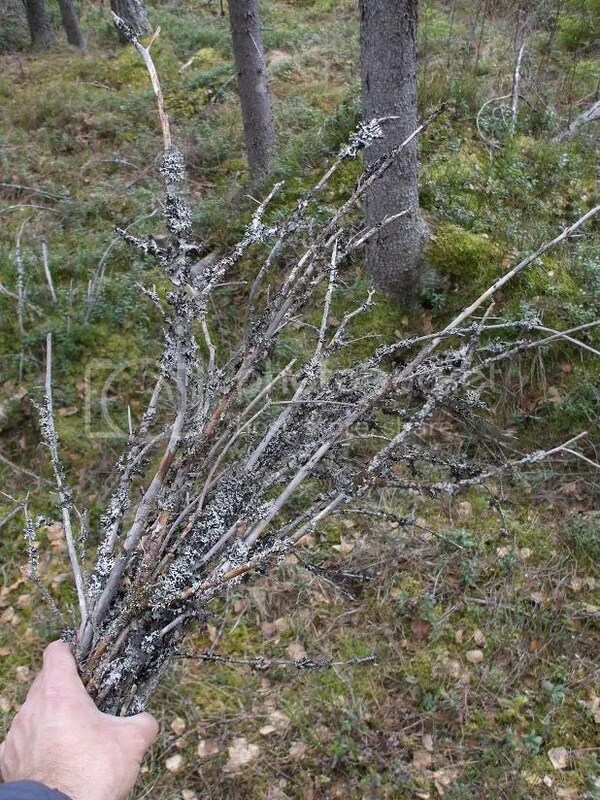 After that, I quickly put the dry spruce branches on and then some fuel wood. The fire got started in no time. What about the other mystery package, you ask? I recently picked up some dry cured sausage from a specialty shop in town with the intent of using it as a meat source for my outings. I cut off some pieces and wrapped them in paper before leaving home. 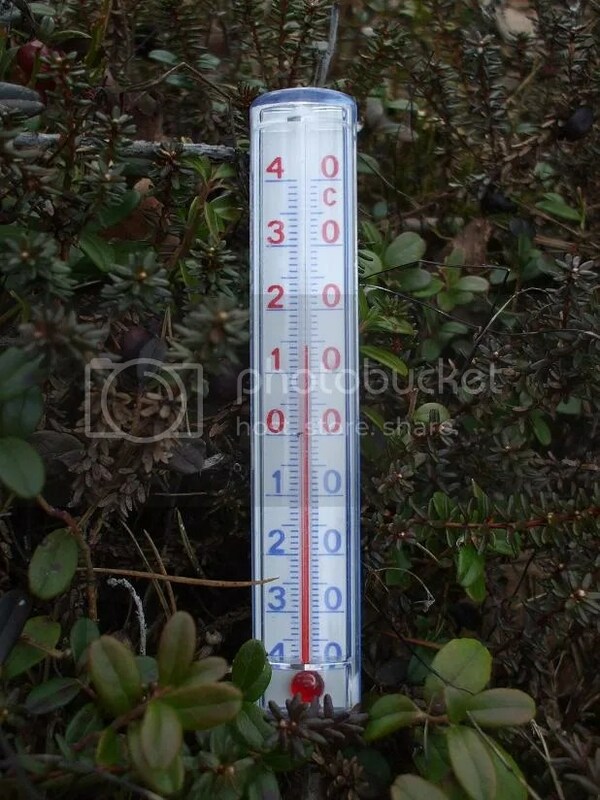 After lunch, I checked my thermometer: 14*C/57*F…perfect temperature… 🙂 I started bringing along a thermometer one winter to see how cold it was and now I do it out of habit. I kicked back and enjoyed a bit of outdoor reading. 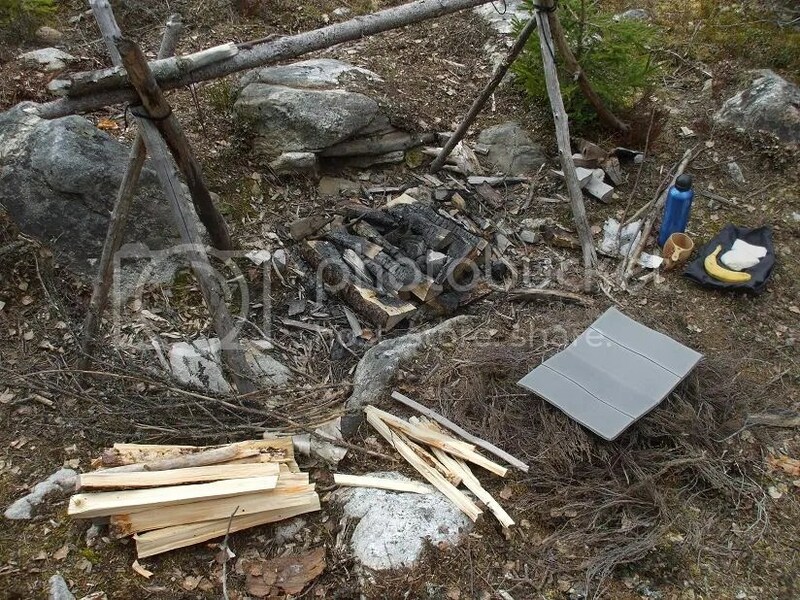 After a while I packed up, soaked my fireplace to make sure it was out (this forest is like a tinder box in early spring, so you can’t take any chances) and headed back to the lake. 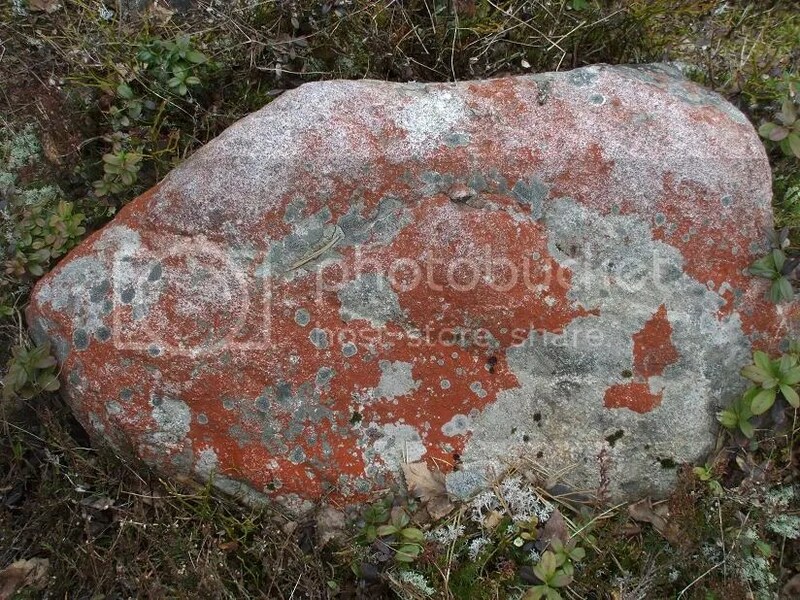 On the way, I passed this rock with red lichen growing on it. Looks like paint! 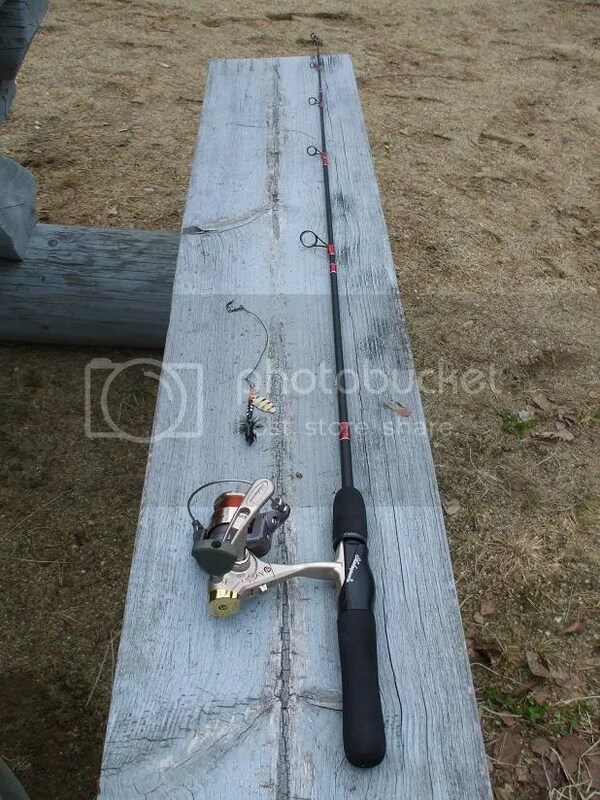 Back at the lake, I whipped out my fishing gear: ultralight reel with travel rod and lures on top, hobo fishing rig on the bottom. 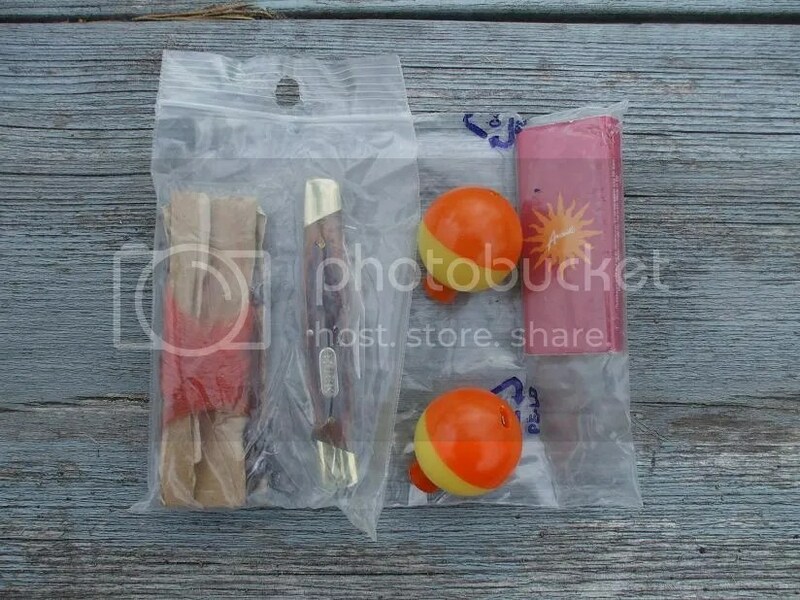 Speaking of the hobo fishing rig, I recently added a few more items to mine. In addition to hooks, line, sinkers and two bobbers, it now also contains a small slipjoint knife and matches. I put together the spinning outfit and put on my favorite spinner for this lake (seems to attract just about everything). Hope you enjoyed this short early spring outing! 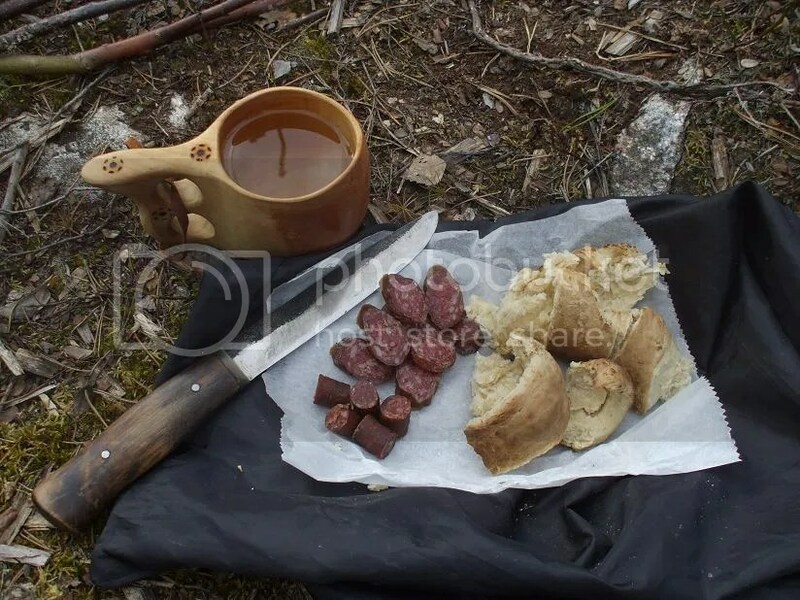 This entry was posted in Axes, Books, Bush cooking & wild edibles, Bushcraft, Cutting tools, Fire/Firelighting, Fishing, Gear, Hiking, Knives, Plants/Trees/Fungi/Lichens, Tools, Wilderness backpacking and tagged Axes, Books, Bush cooking & wild edibles, Bushcraft, Cutting tools, Fire/Firelighting, Fishing, Gear, Hiking, Knives, Plants/Trees/Fungi/Lichens, Tools, Wilderness backpacking. Great post. I have to say I have never heard of bannock mix, what is it? 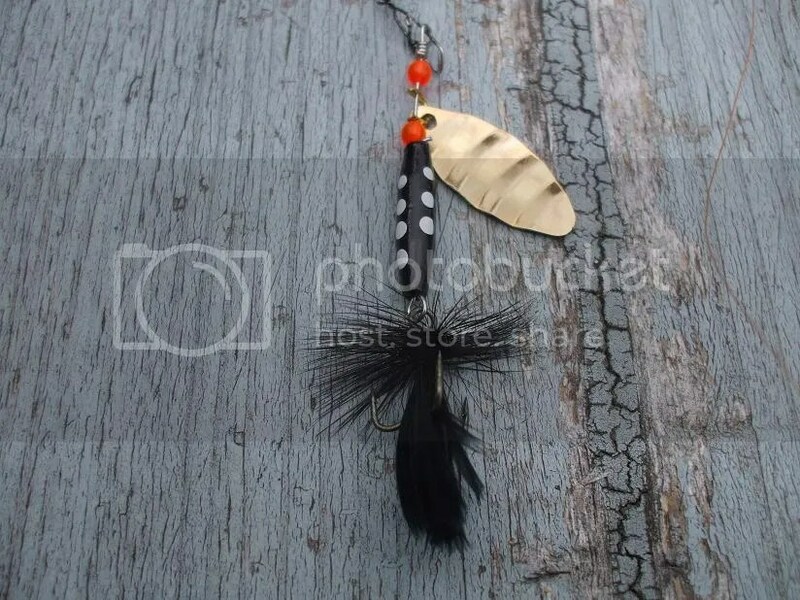 My favorite lure is the same design spinner as yours. Except it is mostly yellow with red dots, kills the smallmouth bass around me. 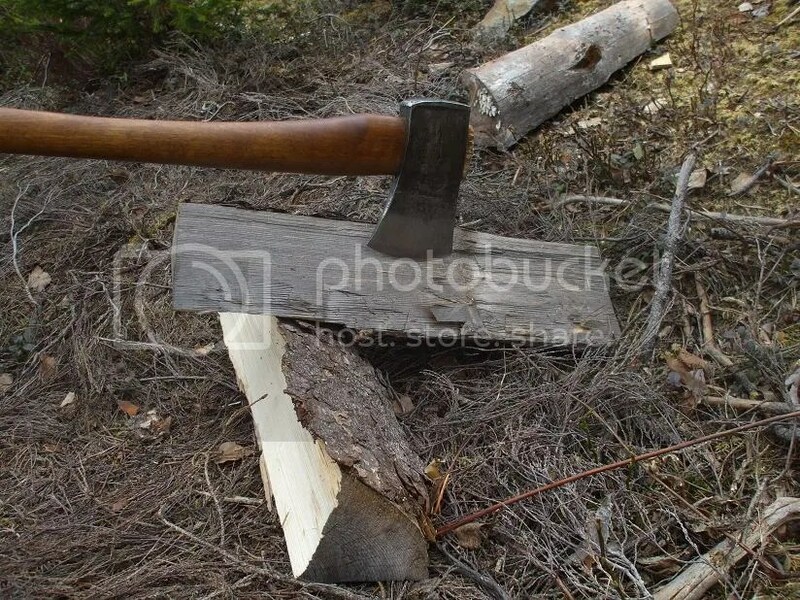 What kind of axe do you carry? I assume your pack is an ALICE pack? Have a good one. My bannock bread mix is pretty simple: 1 cup flour, 1 teaspoon salt, 2 teaspoons baking powder. Mix in enough water to make a DRY dough. If I’m making it at home, I’ll also add some butter before adding the water. Then bake as you please. 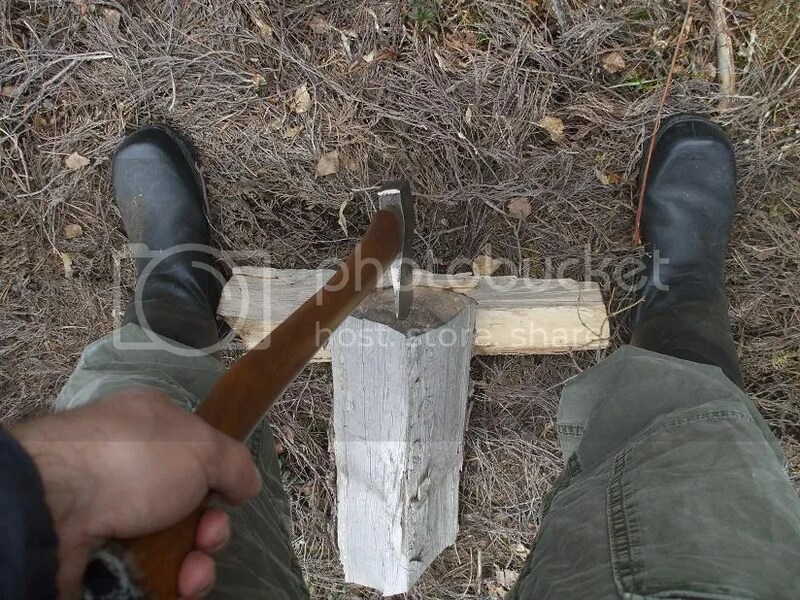 My axe is a vintage Gränsfors Bruks I bought at a consignment shop a few years ago and restored and rehandled. It has a 2 lb. head and 26″ handle. The head was made some time between the 50s and 80s. Excellent post! Looks like a great trip and great write-up. I’m pretty partial to the military surplus packs as well. I’ve used a USGI one for years. 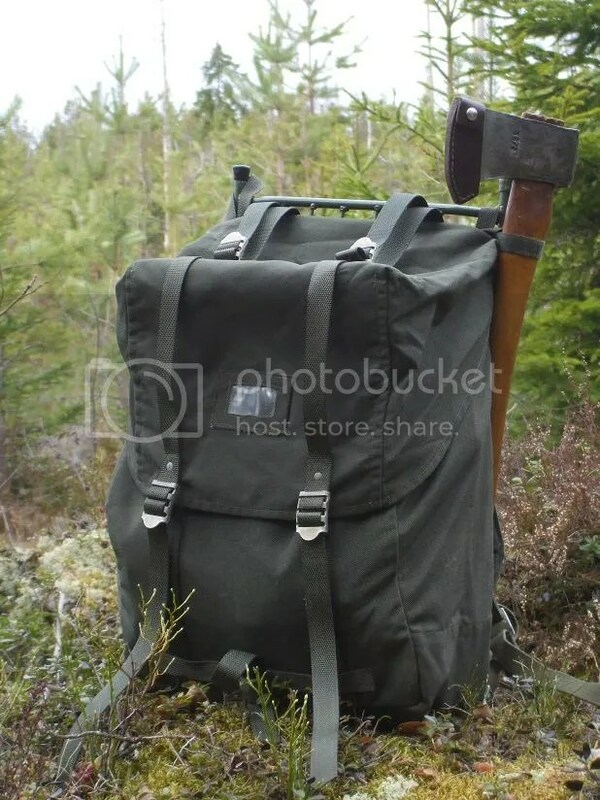 I’ve tried the expensive civilian models but I always go back to a tried and true pack. Thanks for the link! Thanks, Duncan! I really love mil. surp. pack. Don’t know why! thanks for the trip report I enjoyed it, Doug. A lot of nice photos! 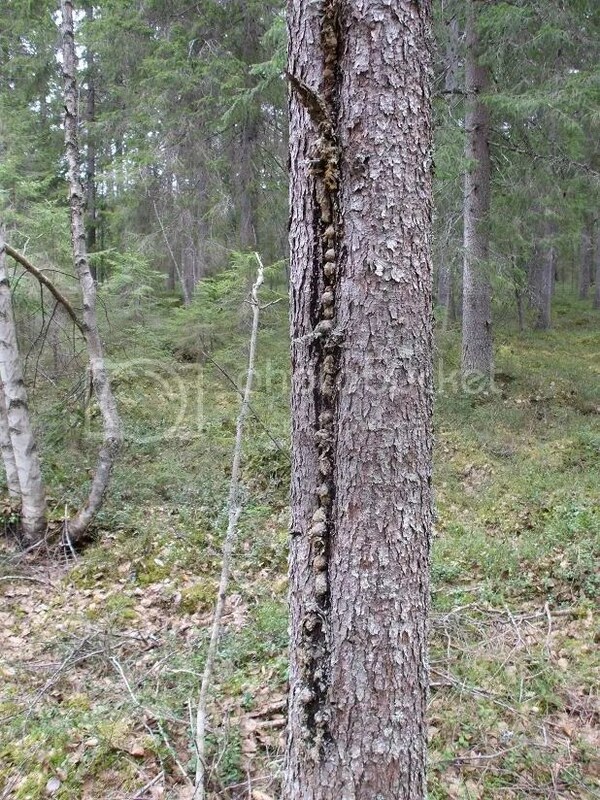 I would guess the spruce was damaged either by a lightning strike, or another tree falling against it and sliding downward. Thanks, Gorges. Good guesses! I’ll have to do some investigating in the surrounding area. 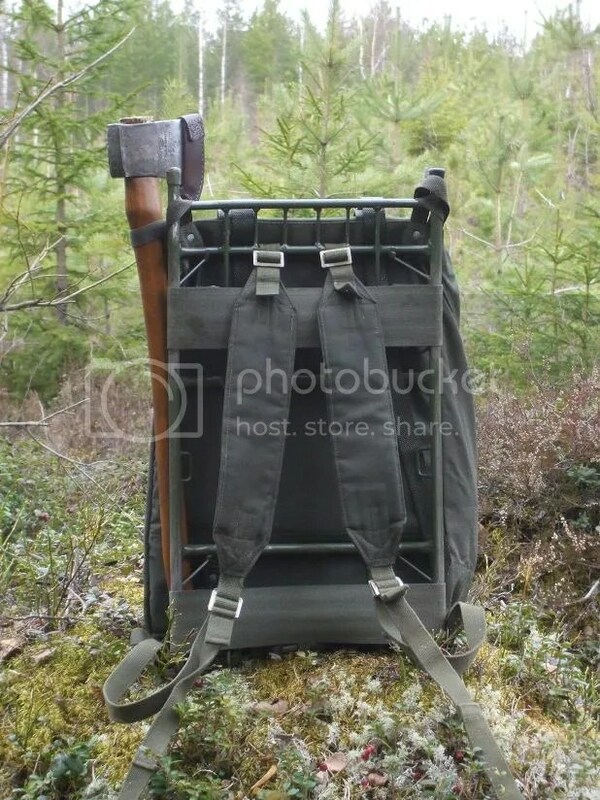 look forward to see more of that old-new back pack! I’ve been chewing the gum a lot lately. I think I’m addicted to it now. 🙂 Spruce gum was popular in the US for many years before modern gum. I have read that it has anti-bacterial properties. I’ll look into it more and let you know what I find! 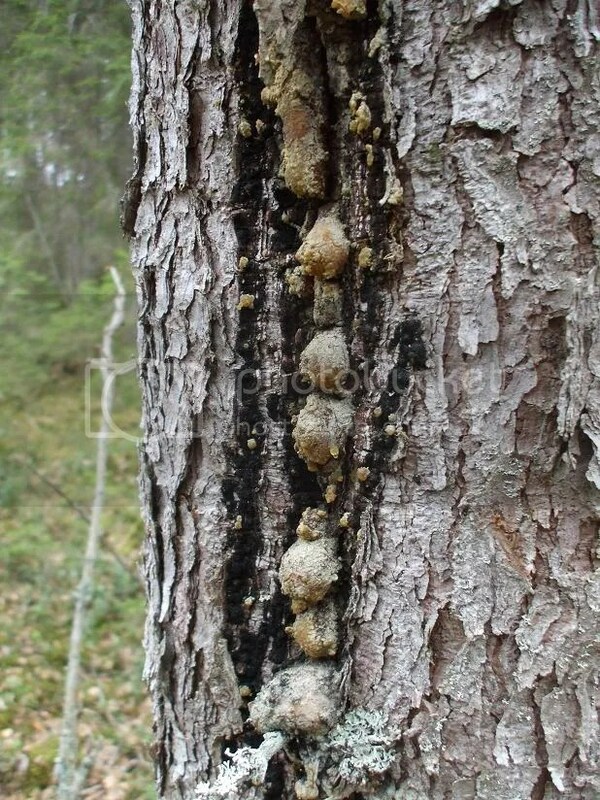 Yes spruce and pine resin have antibacterial properties and it have been used widely to treat woundsand cuts (made as salve) in Finland. Good to see you going again, “neighbour”! The pack looks familair. Swedish army surplus? How’s the book? Always interested in those…. Thanks for sharing this with us. That’s pretty much all of the woodsstuff I get to see these days. I’m enjoying the book. It’s a little dated, but there’s still lots of great, practical information. 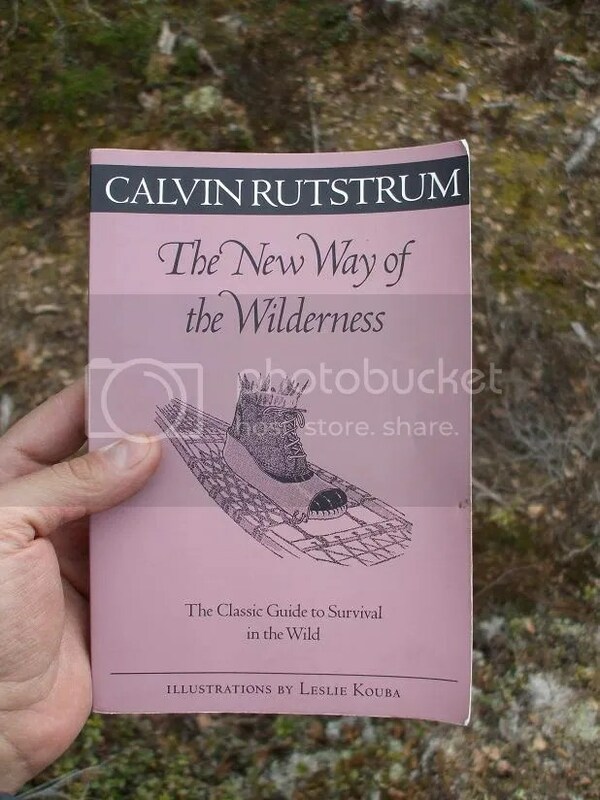 I like how Rutstrum re-engineered just about everything he used so that it suited his needs because I like to tinker a lot with my gear as well. I like the pack,great pics thanks for sharing. 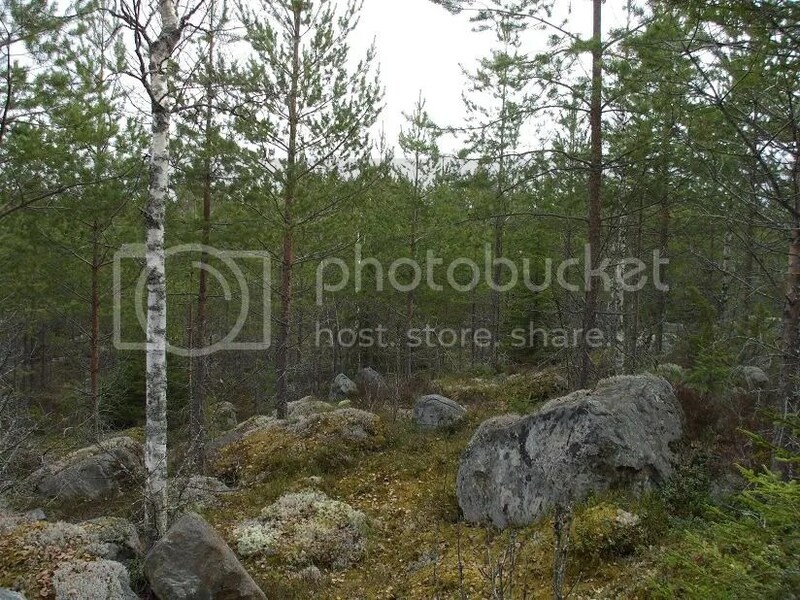 Nothing beats walk in the forest when nature is just waking up from long winter! 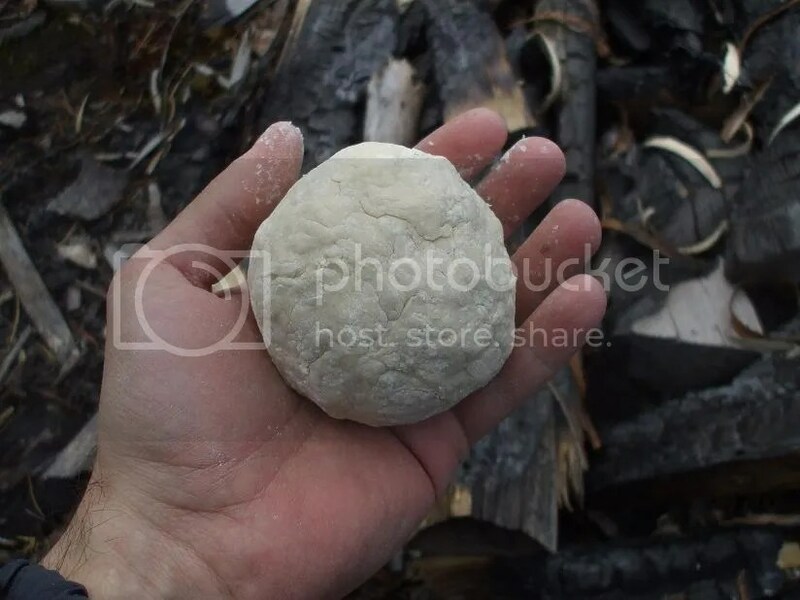 Have you ever tried to make glue out of spruce or pine resin? Very true. 🙂 I have not tried to make glue out of resin, yet. I’ve only chewed it so far. 😉 I have several future projects in mind which might use some spruce or pine resin, though. Nice to see some swedish surplus 😉 Nice LK35! 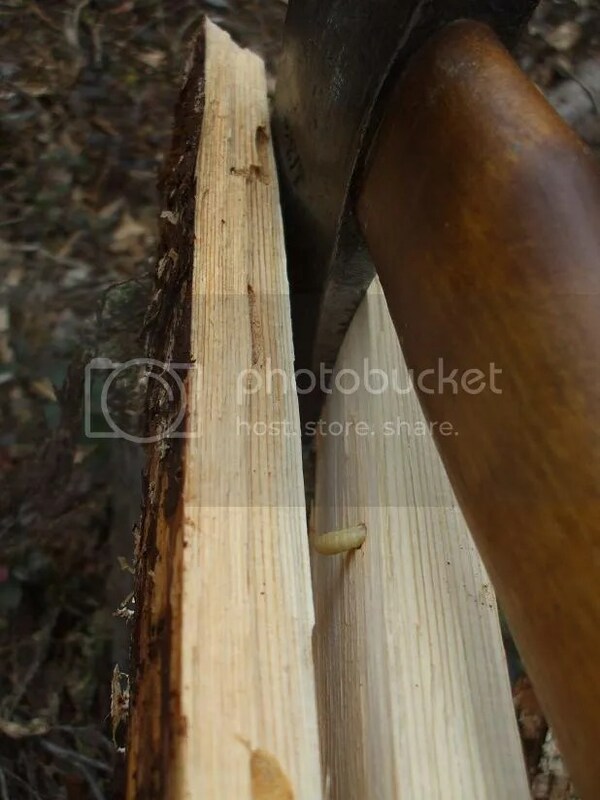 Hello Mr. Woodsman. 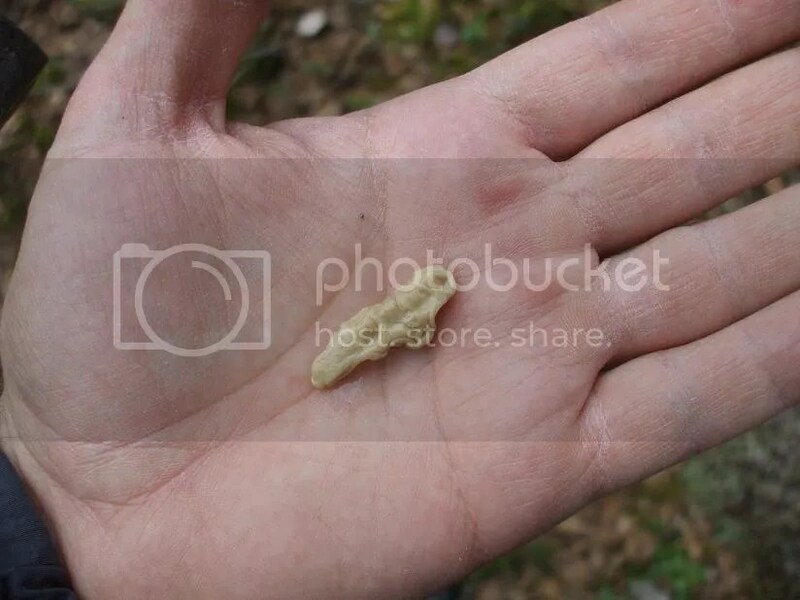 I have been reading your blog for quite some time (albeit from work……not a lot of work right now) I found your blog from a rather old post about the buddy burner. I too hadn’t ever heard of one. I Googled it and your blog was one of the first things that came up. 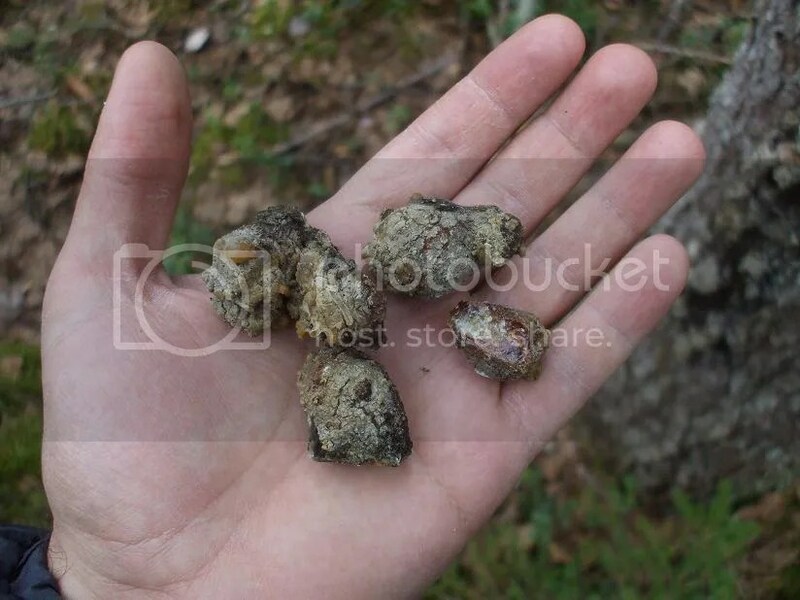 Love the blog, love the photos. Reminds me of Michigan before I moved to California. Thanks, Conrad! I appreciate it. 🙂 Glad you like the blog! Seriously nice trip man. That looked like a lot of fun. Nice chopper you got there too. Great post! I love reading about different packs actually getting USED. 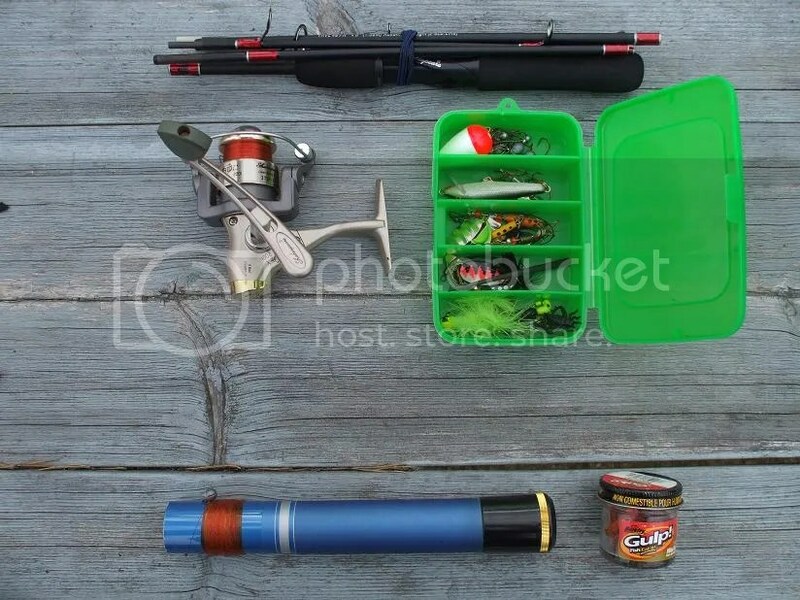 Solid tips, great pictures! I’ll be following the blog from here on out!